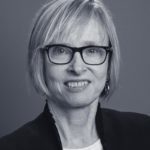 Susan Rothwell is a member of DBM’s estates, trusts and private clients practice area, as well as its charitable, not-for-profit and religious institutions practice area. She advises clients on estate and tax planning for wealth preservation and prepares wills, trusts and other vehicles to achieve client goals. She assists clients with strategies to protect assets, minimize taxes and transfer wealth to future generations. For clients who wish to make charitable donations, she advises on strategies that benefit the charity while maximizing tax benefits to the donor. To avoid the financial and emotional costs of litigation, Ms. Rothwell works closely with clients to manage conflict among family members. She also works with Executors and Trustees on tax, fiduciary and estate administration matters. She provides assistance to small business owners with estate and succession planning. In the not-for-profit area, she counsels clients on exempt status, planned giving and tax issues. Ms. Rothwell is a frequent lecturer and writer on estate planning topics. She is a member of the Mediation Committee and the Trusts and Estates Law Section of the New York Bar Association and a member of the Legal Problems of the Aging Committee for the New York City Bar Association. She received her Juris Doctor degree from Columbia Law School and an LL.M. in Taxation from New York University School of Law. She also received a Master of Business Administration and a Bachelor of Arts degree from Columbia University. 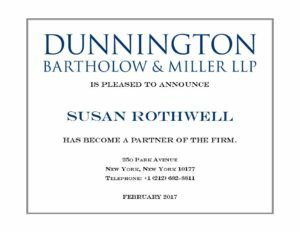 Ms. Rothwell’s email address is srothwell@dunnington.com. Our litigators have successfully represented our domestic and international clients in state and federal trial and appellate courts throughout the United States, and, in addition to filing or defending cases and collecting judgments, we are often called upon for our local knowledge of New York courts. Practice before U.S. Trademark Trial and Appeals Board, including contested trademark registration, opposition and cancellation proceedings. The International Practice Area consists of attorneys who support business and personal clients with respect to the legal needs of domestic clients outside the U.S. and of foreign clients in the U.S. The Firm’s wealth of experience as well as its membership in the Cicero League of International Lawyers and the various languages spoken within the Firm facilitate its providing these services. Oversight of litigation-related or regulatory investigations. Representation of cooperative and condominium boards. Trusts including irrevocable life insurance trusts, charitable remainder and lead trusts, and qualified personal residence trusts. Visa assistance to international students and scholars. Representing charitable organizations and their boards or trustees. Long-term relationships characterize Dunnington’s client base, whether the client is a banking institution, a multi-national corporation or the fourth generation of an original individual client. Our goal is to provide sound, comprehensive services at a competitive cost that achieve practical results and constructive benefits for you in both the near- and the long-term.